*Area, Population and Density rankings refer to Johnson’s relative position among Vermont’s 255 civic entities (9 cities, 242 towns, 4 gores and grants). Complete rankings are here. The first named grantee of the town was a son of the famed religious leader, Jonathan Edwards; the second was William Samuel Johnson, for whom the town was named, considered of equal rank to Edwards as an exponent of idealist philosophy in colonial America. For more than half a century, he was active in three fields: jurist, statesman, educator. A graduate of Yale, Johnson quickly became a leader in the Connecticut Bar, and served several years in that colony’s House of Representatives and on its council. He was the colony’s Representative to England, later to the Continental Congress. He was a member of the convention that wrote the US Constitution as well as one of Connecticut’s two signatories to that document. Upon leaving government service, he became the first president of Kings College in New York, now Columbia University. 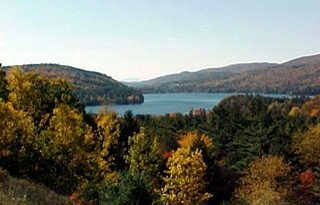 Johnson is in the Green Mountains of Northern Vermont, just minutes to Smugglers Notch and Stowe. The town is perhaps most well known as the location of Johnson State College and Johnson Woollen Mills, but also has a rich tradition of farming and horses. The village of Johnson is home to a number of antique shops, several small eateries, gift shops, world-class craft producers and an art school. The Gihon River joins the Lamoille River here on its journey to Lake Champlain; both are excellent trout water. 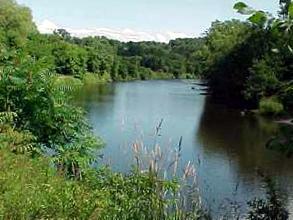 Johnson reflects the beauty, clean water, and rich soil of all of Lamoille County. 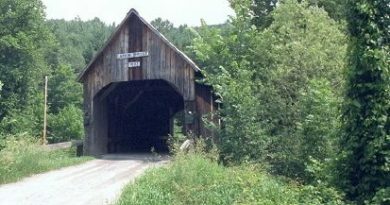 Click Here for a map of all bridges in Lamoille County.